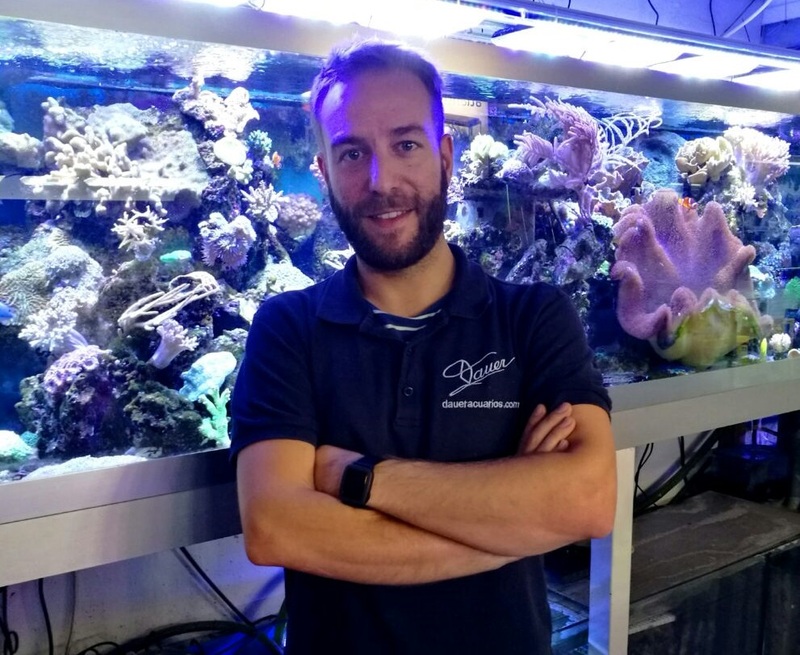 On this occasion, we interviewed Enric, one of the owners of Dauer, the oldest aquarium shop in Barcelona. It’s also one of the most popular shops for aquarium hobbyists thanks to the great variety of products they offer, as well as the aesthetics of the store. Despite being small, it stands out and is highly regarded by customers and aquarium enthusiasts. You are the oldest aquarium shop in Barcelona. While other shops have opened their businesses only to close them because of financial troubles, you maintain a high flow of customers. How are you able to survive in these rough economic times? Enric: I think the main reason is that this is a family business that has been operating for many years. The original business was created by a German man named Dauer in 1933―that’s where the name comes from. My grandfather bought the business in the 1960s and we’ve had it ever since. My grandfather believed in proper customer care and we have always followed what he taught us: treat the client as a person, not as a client. We worry about satisfying their needs. I guess people notice this and keep coming because we give them a more personalized treatment. What makes you different from other aquarium stores? What really sets us apart from the rest is the way we treat our customers. Being a family business, we treat the customer in a more personal and warm manner. We don’t base our philosophy on selling the most merchandise. Instead, we listen to our customers’ needs and help them find a solution to their problems. Other stores only look to sell customers their top of the line items in order to help their bottom line instead of selling a product that will meet the customer’s needs. We constantly hear customers talk about stores where the owner didn’t care about their needs or problems and instead sold them something that didn’t suit their needs despite the owner’s insistence that it would help them. Maybe we don’t have the cheapest prices or deal with the cheapest brands like the Chinese ones, for example, but we seek the greatest variety of quality products possible. If someone comes to buy a product, we take time showing that person how it works, what properties it has, and why it can suit them well. We just do it naturally. Everyone gets the time and attention needed to discuss their individual situations. We offer that time and dedication because we are concerned about our clients’ issues and we like to make sure that our customers leave satisfied. Another aspect is our sincerity. We correct customers who attempt to buy incompatible animals or products that don’t fit their needs. I prefer to inform customers and tell them that they are making a mistake instead of shutting up and selling something just to take their money. We know that some of our products are alive; they are fish and aquatic animals and we want them to be in the best condition both in the store and homes. I would never sell an animal knowing that it’s going to die because the person doesn’t understand how to care for it. How do you get customers back again? As I said, the customers return because they feel valued in our store. We also try to make the customer satisfied with their purchase or simply their visit. We don’t want to sell customers a thousand products in one visit only to have them not return because they think we lied to them or treated them badly. We prefer to have satisfied customers who get what they wanted or who have left our store with their current problems solved. By doing this, the customer is more likely to return. You have an online version of your store, has this helped to increase your sales or do some of your old customers now buy your products online instead of going to the shop? We opened the online store as an extra service to help customers who have difficulties coming to our shop. Surprisingly, we now have customers from all over Spain. We assume that our wide variety of products attracts customers or our online shop simply attracts attention. In general, the online version of Dauer was made to be a complementary service to the physical store, not a replacement. While we have noticed an increase in sales, we didn’t create the online store to compete with our physical store. Our online prices are the same as they are in the physical store and those prices aren’t always better than competing stores. What we like most about our online store is that it helps us tell our customers about new products we acquire and other types of news regarding our business and industry. Apart from the website have you implemented any new features to adapt to the needs of your customers? Yes, we realized that the online store prevented us from providing our customers with the warmth that characterizes our business. To help that, we decided to implement an online chat on our website where people can talk to us directly about any issues and get answers fast. It’s not as personal as it is in the store but it’s a way of being able to replicate our service online. In the chat we answer the questions ourselves instead of through automated responses so all clients get an individualized experience. Do you teach your staff or do they come into the business with a knowledge of aquariums and aquatic animals? In Dauer, there are five people: my parents, two partners, and myself. One of my colleagues, Abdel, is a handyman who has shown an interest in the business that made us want him to be a part of Dauer. We taught him about the business and we value his skills in creating structures. Being a handyman in the world of aquariums is something of great value since he is able to build things, but that isn’t enough. You must have knowledge of animals, electronics, and plumbing to best succeed. Through our teaching and his natural skills, he has become an asset to the business. My other partner, Xavier, started out as one of our clients so he already had a basic knowledge of aquariums so it was easier to train him. Each one of our employees brings different qualities that we value. What system do you use to advertise on the internet? Do you use Google Adwords, Yelp, or anything else? We use social media networks a lot. We like to connect with our customers on Facebook. We get to know their interests and can show them the new products as soon as they enter the store. We also use Twitter and Google+ but the platform we use the most is Facebook. We also run campaigns with Google Adwords, but for specific campaigns for specific seasons. The website has been well optimized to have a good web positioning but we don’t run continuous campaigns. Now, we’re in a marketplace that is a sales platform for the pet stores sector, think of it like a kind of Amazon for selling pets. What is more important, the quality, the price, or the variety of the products for the businesses in your industry? This has changed a lot. We have seen a change in what customers are looking for. Before they looked for more quality and the price was not as important. Now, everyone is comparing prices. It’s normal since economic times are tough and people are working with tight budgets. We used to have products that were not as affordable, but were high-quality. Now, we have to add more options for the same product because customers like to be able to compare prices, even if they end up with a lower quality product. In my opinion, it’s more important to offer a quality product that may be more expensive than to sell cheap products that might not work as well. However, times change and we have had to adapt to those changes. In the case of fish, people don’t look at the price, they look for variety. They don’t seem to mind paying for more expensive fish that are more exclusive. I personally believe that in any business, there must be a philosophy that combines quality, price, and variety―this is the way to stand out. Does Dauer intend to expand? Our deal with the customer is possible thanks to the current conditions of the business. It might be small but we have customers who come to us because they want different customer attention then they get from a large company which doesn’t care about them. Some customers have been coming to us for more than 30 years and do so because of the service we offer. Currently, we do very well and have no plan to change our style; we prefer to do our current job well instead of spreading the business thin and doing a poor job. Finally, what would you recommend to aquarium stores that are not doing well in business? What do you recommend they do to improve? I simply want them to know that it’s very important to keep your customers loyal. We are in an industry where the customer has to be able to trust the salesman and be able to think about them as a trusted salesman. You can’t fool the customer or want to sell him something just make a sale. Many sellers make the mistake of selling products that aren’t going to be useful just because they want to get rid of the customer. Sometimes businesses forget that the customer should want to come back, and it’s better to have them leave satisfied with one perfect purchase than have them walk out with many useless products that they don’t need. In the latter situations, the customer will not return and will not speak well of the business. Instead, by giving them the best possible treatment, the customer is more likely to recommend the business and possibly bring new customers with them next time.